Having worms is a nasty experience for dog and their owners. They can be debilitating and fatal if not treated quickly and correctly. There’s more than one way to treat intestinal dog worms, too and we’ve listed our recommended ones here for the different treatment method. Most people have heard of intestinal worms and probably more often than not dog worms. But did you know there isn’t a single type of dog worm and not all of them are same or pose the same level of concern? Some worms are harmless and they’ll just pass but there are four types of worms that actually pose a threat and we’ll go through them here and advise on what you should you do if you think your dog has them. Roundworms are the most common and the most lethal to dogs. They can even be passed on to humans which is further evidence that you should treat your dog if you suspect it to have a roundworm infection. Almost every dog will have a roundworm infection at least once in their lifetime, most probably as a puppy. There are two species of roundworm: toxocara canis and toxascaris leonin and they are both absolutely disgusting like the image above. They steal nutrients from your dog which can lead to many of the symptoms below. Is your dog always hungry? Chances are your dog could have roundworm who is stealing your dogs food before your dog can use the nutrients themselves. Roundworms are dirty worms and prevention can be easily done by keeping their living area clean, keep them away from faeces of other animals and stop your dog from eating wild animals. Of course if your dog already has roundworm then one of our recommended dog worm treatment will do the trick. Hookworms are vile creatures, sometimes black in colour that are menacingly hook-shaped and strip a lot of nutrients from your furry friend. Due to the sheer amount of nutrients they take they can be fatal in puppies which is why worming in puppies is such a big deal. But of course, adult dogs can have them as well which means its important to be educated in symptoms and proper treatment via dog worm tablets, dog worm granules or dog worm liquids. Prevention of hookworm is similar to prevention of the other worms – dirt and contamination. Keep your dog away from faeces, contaminated water and environment. If you see any of the above symptoms take your pooch to the vet or get your hands on one of our recommended dog work pills, powder or syrup. Whipworms are surprisingly hardy and can survive in the wild for up to 5 years. The best prevention of whipworms is a clean living area and regular worm prevention treatment rather than using worming treatment when the dogs gets an infection. Prevention is relatively straightforward – regular flea treatment, worming treatment. 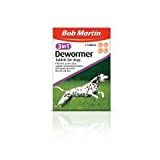 If your dog has reached the stage where tapeworms are present then one of our recommended dog worm tablets, granules or liquids will do the trick. You can’t always prevent worms as they are very common. Fortunately, prevention of these parasites is also very easy. You may have noticed from the above content that worms are dirty, filthy scoundrels that like to hang around in dirty places and with other dirty organisms like fleas and rats. Here are some golden rules to follow to stop a worm infection in the first place and remove the need for treatment. Tablets are the most common method to treat your dog of worms. They can be quite strong and work quickly as the tablet dissolves and gets to work, however some dogs are funny when it comes to tablets and may spit it out and not take. You may find yourself needing to crush them down into powder and then sprinkle into their wet food. WORMclear Tablets are great because they’re cheap, effective and could work in just one dose. To help with a stubborn dog they do have a slightly meaty flavour to entice them. You can get a box with 2 or 4 tablets. We recommend the 4 so you have enough to treat the dog now and in the future should another infection happen. A great product for dogs that do not like tablets but you are in need of a quick and strong treatment. You get enough for 4 treatments which is more than enough for even the most serious of infections. All you need to do is mix it up in some soft, wet food and you’re good to do. A bit like the crushing pills scenarios only you don’t need to do any crushing. A convenient worming granule sachet that gives you 6 treatments worth. Mild and easy on the tummy and easy to give to your dog, just mix into the food. They are also effective for reducing prenatal infections in expecting dogs. Using this treatment will reduce the risk of transferring toxocara canis to your female dog’s pups via her milk. If your doesn’t like pills and doesn’t like the powder effect of the best dog worming granules then why not try worming cream or syrup? Beaphar’s working cream is applied by dabbing it on your dogs nose or lips and letting them lick it up or on top of they’re favourite treat like a dip. The syrup is pretty straightforward and can be injected into the dog’s mouth. Easy pease and the (apparently) taste great!